Minnesota started this season with three catchers on the roster. Jason Castro caught Jose Berrios on Opening Day. Mitch Garver started the team’s second game. 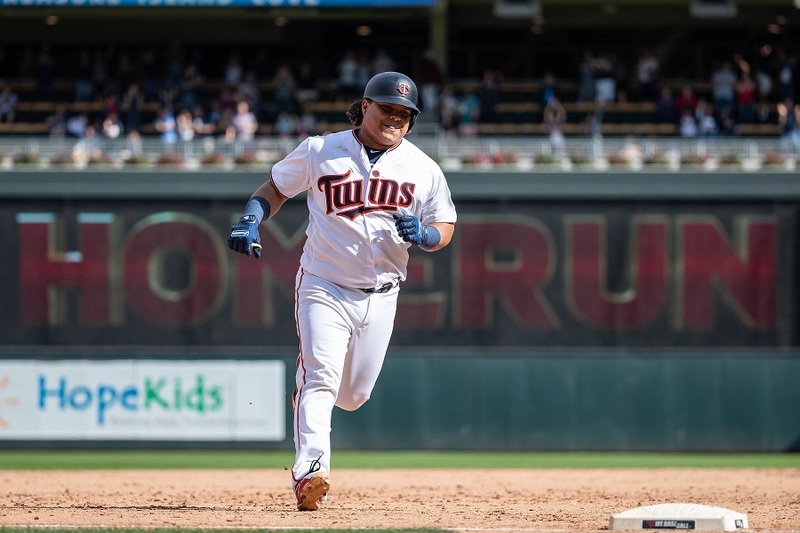 Fan favorite Willians Astudillo starred on Sunday afternoon. Each catcher offers a little something different and it’s hard to know how rookie manager Rocco Baldelli will utilize their strengths. How will these three catchers be rotated in the season’s early games? There seems to be three different options when it comes to rotating through this trio of catchers. Each one has its own benefits and downfalls. Let’s examine each one. Using a strict rotation might be the pattern Baldelli will follow to start the season. Jason Castro got the Opening Day start. This made sense because he was a left-handed hitter and Corey Kluber, a right-handed pitcher, was starting for Cleveland. Castro was also the more veteran catcher and he was returning to the field for the first time since the knee injury that cost him all of last season. On Saturday, Mitch Garver, a righty, got the start. He was facing a right-handed pitcher in Trevor Bauer. On paper, it might seem like this isn’t a good match-up, since it would be a righty vs. righty scenario. However, Garver batted .288/.352/.454 against righties last season. To put that in perspective, his OPS versus right-handed pitchers was 177 points higher compared to when he stepped in against lefties. Sunday saw Willians Astudillo make his first start. He went 2-for-2 with two runs scored and two RBI. He also made a tremendous defensive play when he was backing up a play in foul territory. This means Castro will sit for a minimum of the end of Thursday until Tuesday’s series opener in Kansas City. If Baldelli is going to rotate through players, these early season off-days are going to make it tough for the catchers to get into a rhythm at the plate. A natural platoon seems to form with Garver being a right-handed hitter and Castro being a left-handed hitter. Baldelli could play the natural match-ups but this would put Castro on the field far more than Garver. As mentioned above, that might not always be the best option since Garver has some reverse splits. Garver is actually better than Castro at hitting right-handed pitching. For his career, Castro has hit .241/.326/.412 against righties. His OPS against lefties is 171 points lower. While a strict rotation might make some sense, Garver needs to be in the line-up against lefties. Garver doesn’t destroy the ball against lefties (.629 OPS), but his numbers are better than Castro's. Astudillo has been unreal at making contact during his big-league tenure. Through just over 100 plate appearances, he is hitting .368/.386/.547 with 10 extra-base hits. He also doesn’t have much of a platoon split. His OPS is .949 against righties (67 at-bats) and .893 against lefties (28 at-bats). Some team’s like for a pitcher and a catcher to build rapport with each other. It certainly seemed like Castro was working well with Berrios. Berrios might have been able to make any catcher look good during Thursday’s game. If the Twins keep rotating catchers, Castro would catch Berrios and Garver would continue to catch Odorizzi. Astudillo caught the Pineda/Perez combo on Sunday. Gibson has yet to make a start, but it seems likely for Garver to catch him in the second game of the Royals series. Pitchers can get comfortable when the same catcher is working with them behind the plate. It seems likely that a personal catcher could be a luxury, but it seems unnecessary at baseball’s highest level. All of these players are professionals and have worked with a multitude of battery combinations throughout their playing careers. A personal catching system might naturally form from the catching rotation but it’s not a necessity. Castro’s contract expires at season’s end. Garver is coming off a strong 2018 campaign and he can’t reach free agency until 2024. Minnesota needs to see if Garver can be the team’s long-term solution behind the plate. As the season progresses, the team could continue with a rotation or ride the hot bat. Hopefully, Garver is taking the reins and showing he is ready to take the next step. If you were in the manager’s chair, how would you approach the catching situation? Leave a COMMENT and start the discussion. Personal catchers for personal starters. AT some point, you ask would Garver be better served catching everyday at AAA. Especially working with the starters of the future. If you are going to be playing Castro 2/3s of the time. Willians is such a unique player, though! It's a tough decision. I think Willians probably needs to see some time at 3rd. April is going to have to play out before any decisions are made. Too many days off. This will sort itself out as the season plays on. Castro has had multiple surgeries and won't be able to play a lot of games as the season wears on. Other injuries will create openings for Astudillo, or maybe a trade opportunity for Garver. It's a good problem to have at this point. Right now I'd be looking at ways to get Astudillo batting right behind Buxton. I'd have Buck bat 5th or 6th, with Tortuga right after him. Hot bats in order, great contact behind blazing speed. That might mean sitting Gonzo so Torts can play 3B. So be it. Not quite ready to bat Buck at 1, but if he keeps hitting, he's designed by nature to be a leadoff. At that point, I do believe I'd bat the little chubby guy 2nd. AT some point, you ask would Garver be better served catching everyday at AAA. Absolutely not, imnshueo*. He belongs on the major league roster, sink or swim. If he's spending any more time in AAA at this point, it means he doesn't have a future on the major league roster going forward. Initially, early on, it's not a debate or problem. Matchups or metrics, you rotate behind the plate through April. You want your catcher as sharp as he can be. But all of them have countless innings played behind the plate at all levels. They will not suddenly forget how to catch. With Astudillo's flexibility, his bat can stay sharp in the field at different positions as well. No reason he can't play some 3B and let Gonzalez take a day off or rest someone else. Isn't that really why he was brought on board? I think the Twins missed Castro more last season than anyone wants to admit. We get obsessed with offensive production, and forget what else a player may bring to a team. But here's the rub. Garver got better defensively as last season went along. Astudillo has done nothing to show he isn't solid, at least, behind the plate. Each offers up so much more AT the plate than Castro. Injuries influence rosters and decisions. But at some point this season, barring substantial injury, the Twins will have to make a decision. If the growth/development path continues as we have seen it, Castro may be traded to a team needing help. A Garver/Astudillo platoon offers so much more unless there is an obvious defensive/leadership differential. A few games in, Sano still on the IL, it's not a decision that has be made now. I think you left out an option: just start Astudillo all the time. I love Astudillo.There, I said it.He needs to be a part of this team.If he were 40-lbs lighter there wouldn't even be a debate.Because of his appearance, people can't fathom him being able to sustain. If Castro is catcher #1, I think our best roster is a 4-man bench consisting of Gonzalez, Adrianza, Garver & Willians.Three of them can play almost anywhere and provide the luxury few teams have of carrying a 3rd catcher.I like Cave, but he has an option left and would be merely a phone call away in case of injury.Austin has great power, but offers little else.Maybe he could net us bonus money or a prospect, or we risk that he clears waivers. I don't think 3 games is hardly a sample size to have any idea what the manager or FO thinks. If Darver and Zstudillo catch well enough and hit well enough Castro ends up the odd man out. Castro is likely the best defensive catcher of the three, but his knee surgeries may make that determination moot. It's hard to tell which of Garver of Astudillo is better, since Astudillo hasn't caught much up here. But I personally think he's better than Garver. Garver is supposedly catching because of his hitting. But the problem is, at this time Astudillo is a far better hitter, so that should settle the decision between those two. I like defensive catchers, but I don't think Castros defense is enough to make the difference. Calling the game? Until someone tells me what every catcher is looking at when the turn to the dugout before each pitch, I will continue to think the the dugout is calling, or suggesting the pitch. I know it’s a still a small sample but I think this lineup needs Astudillo’s bat in it most days regardless of the position he plays on the field. Astudillo needs to be utilized more as a PH or a starter at 3B or OF. There is no excuse to keep trotting Kepler out there late in the game against LHP when close and down, if you want to win the game. Play La Tortuga every day, whether it be catcher, third base, outfield, or someplace else. He needs to be a lineup regular. The catcher "conundrum" is really depth that winning teams naturally have. It is nothing but good and Rocco just has to make sure the guys get their ABs. There are enough to go around. Last year... there were rumors that the pitchers preferred to pitch to Bobby Wilson. I don't know if that was true or not but Wilson got a lot of inexplicable starts so I am willing to strongly consider the possibility. Our team ERA was 4.50 and we were sellers at the trade deadline. Personally, I'm against anything locked in. This catcher catches this pitcher is just another form of auto-pilot managing and I've had it with auto-pilot managers. Manager need to make decisions based on what is happening in the moment. If Baldelli were to try personal catchers... Baldelli will need the ability to look our pitchers in the eye and promptly take it away if the results don't support it. This pretty well summarizes how I've been thinking through this. Castro's D definitely has value, but even with Tom's awesome pitch-framing graphics, there are a lot of intangibles at work and it is hard for me to quantify overall defensive contributions from one catcher to another (and having never played catcher, it's a tougher read for me than other positions). Offensively, with Astudillo eclipsing 100 ABs, it sure looks like his bat can play at more than just catcher but if he can catch, he adds a lot of value offensively to the lineup. Defensively, he doesn't seem out of place - or at least he doesn't look any worse than Garver to me and IMO he actually appears to be the most athletic of the 3, which in theory should give him the most upside to improve there if he gets enough reps. I'm excited to let this play out a little more and see what we have! Castro hits left handed...but at this point in his career he hits like the one-a-week catcher. In a perfect world, he'd be the back-end platoon guy. Garver got 300 AB last year. Hit .268 with 7 HR and 45 RBI last year. He looked like the heir-apparent on a rebuilding team. He didn't look great, defensively. But he didn't do anything to lose his job. Astudillo all of a sudden appears and now it's bedlam. He aced his audition last year. He earned a job in Spring Training. And now right out of the gate he's an offensive force in the first game he plays. He absolutely has to get playing time, somewhere, anywhere at the big league level. I know sending Garver to AAA just seems so cruel. But in the end aren't we picking between Astudillo and Garver here? If you had to choose one of those players to play 4 days a week, who would you pick? Astudillo needs to get his next 100 PA in short order. If he comes close to repeating the production over the first 100 PAs, then, I'm sorry, but Castro, Garver, Gonzalez and Sano should take a back seat to Astudillo being in the lineup every day. If it all falls apart, then you still have those four to fill two positions each day. Right now, even Vlad the Impaler and Dr. Smooth would be blushing as they witness the bat-to-ball skill. While I agree with the first part, I'm getting close to hoping for Baldelli's next "mistake". I don't think anyone is going to let that one go until he makes another one. Kepler is 0/2 PA against LHP so far. There is only one sample size smaller than that. "Keep trotting" is a phrase I would save for something like the LoMo experience last year. When Blaine Parker comes in to pitch, put all three catchers behind the plate. No more wild pitches!!! Have to try to give Astudillo more at-bats at this point and see how he progresses. FWIW, he's younger than Garver. Someone smarter than me would need to calculate the hit defensively vs the likely win offensively if you went the Garver/Astudillo. Something tells me the pitchers wouldn't be thrilled with that. Astudillo's got 101 PA...there probably isn't a pitcher in the league that has saw him a second time yet...or a team that has game-planned him. So, we'll see. But if he hits, he hits...and then it might be time to think about getting in shape so he can take the grind and his club might realize his (potential) defensive flexibility at positions other than catcher. It's funny how being 40 lbs past your ideal body weight is endearing when it's an over-achieving career minor-leaguer, but a lack of dedication and professionalism when it's a struggling big bonus-signing top prospect. I don't like the personal catcher route; all the pitchers would ask for Castro due to his veteran reputation, whether it's deserved or not anymore. I'd start Garver behind the plate about 50% of the games and Castro and Astudillo 25% of the games each, with Astudillo getting time at other positions more days than he's riding the bench. If this all gets to be too entangled, the team could do the inevitable and find Austin a new team now, making Garver the off day 1B as well. If Castro has the skill to reduce the number of pitches in an inning and game that impacts the staff long term. It might help the starter go an extra inning and reduce the load on the pen. It might help the pitcher stay stronger keeping him out of long innings. This has a positive long term impact. Last year Wilson was the main catcher for Berrios and Gibson while Garver was the main catcher for Lynn and Odorizzi. I don’t know how much impact Wilson had on the success Berrios and Gibson. Maybe Gibson and Berrios are simply better pitchers. Would we have been that surprised though if it was Lynn or Odorizzi with the better year than Gibson? How much did Wilson matter? We don’t have the data to make an assessment. We are not in the rooms where catchers and pitchers prep for future games. Maybe that connection is critical. I rely on the staff on this call. I will add that Astudillo has to be in the line up tonight. Play him at catcher or replace him in the line up for anyone other than Buxton or Cruz. Between he and Marwin every position is covered. Put him in somewhere and keep him in at least until someone gets him out. He did play 163 games with 640 PAs and 1260 innings on defense last season spread across the Twins, Rochester and Venezuela. I'm not too worried about him handling the grind. He's a pro. He just doesn't look like one until you see him play. He made 11 errors in those innings. Sano made 10 in less than half (granted Sano logged all his innings in the infield at the MLB level). Darn!The Twins have too many options at catchers.What a horrible problem. I agree that things will work themselves out and I would guess that Castro will be traded at the deadline.